Vitamin supplements have not been cleared by the FDA for therapeutic indications. Accordingly, vitamin supplements are barred from making therapeutic claims. Since vitamins are not proprietary or patentable, there has been little benefit associated with the cost and risk associated with performing clinical studies since anyone would be able to market the vitamin associated with such studies. We believe that most clinical studies on vitamin supplements fail to demonstrate 1) causal relationship between vitamin levels and disease conditions, or 2) efficacy of vitamin supplementation. We think that many of these failures can be attributable to two types of flaws that chronically infect the formulation of such clinical studies. Single measurement. Most clinical studies seeking to demonstrate causal relationships between vitamin levels and disease conditions report ambiguous results. This should not be surprising since most of them rely on only a single measurement of vitamin levels to characterize vitamin levels persisting throughout the study duration. Poor differentiation between treatment and control groups. Studies seeking to demonstrate the efficacy of vitamin supplementation typically include deficient and non-deficient participants in both the treatment and the control groups. This typically results from the combination of 1) random selection of participants for both treatment and control groups, and 2) the trivial dosing method of a fixed vitamin supplement dose to the treatment group and placebo dose to the control group. While this formulation may be useful for studying the effects of exogenous molecules typically studied in drug trials, it is not optimal for studying the effects of supplementing indigenous molecules such as vitamins that naturally occur in bodies. The random selection of participants ensures that both the treatment group and the control group include deficient and non-deficient participants. Supplementing with a fixed dose to the treatment group makes it likely that fewer participants are deficient than the control group. In many studies, this will not result in sufficient statistical power to validate or falsify most well-formed hypotheses. We believe that both types of flaws can be avoided by more and higher frequency blood testing combined with variable vitamin dosing. The ideal formulation is the random assignment of deficient participants to both the treatment and control groups with dosing of the treatment group that ensures each participant transitions to a non-deficient condition and maintains that condition throughout the study duration. In such a formulation, the treatment group contains only deficient participants who became non-deficient through supplementation, and the control group contains only deficient participants. KalibrateV may be used to manage such formulated treatment groups. Through the embedded Wellspring blood test, deficient participants can be selected and variable dosing provided to achieve and maintain non-deficient conditions. The Wellspring blood test, standing alone without the vitamin dosing, can be used to identify deficient participants for the control group. In the event that deficient participants in the control group become non-deficient, replacements can be made in accordance with well-formulated substitution protocols. KalibrateV may be combined with Wellspring (stand-alone blood test) to produce vitamin supplementation clinical studies as byproducts. Treatment groups can be users of KalibrateV. Control groups can be users of Wellspring who are deficient in target vitamins and do not use KalibrateV or other vitamin products. These clinical studies will be designed as crowd-sourced, very high sample size (millions), highly dimensional, noisy data analyzed by advanced mathematical techniques such as algebraic topological data analysis. Leading medical institutions will be recruited to formulate and supervise these clinical studies. 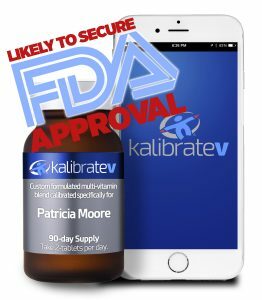 If such clinical studies demonstrate efficacy associated with a specific vitamin supplementation, KalibrateV might be cleared by the FDA for specific therapeutic indications. We believe that certain aspects of KalibrateV’s dosing algorithms might be patented so that the clinical studies only inure to the marketing benefit of KalibrateV. Reduction in cardiac events. Several studies suggest that oral supplementation of vitamin D, coenzyme Q10 and omega 3 fatty acids reduces the level of cardiac events. Thiamine deficiency in diabetes. An increasing body of knowledge demonstrates that patients with diabetes have much reduced levels of thiamine (vitamin B1) in blood plasma. Several small clinical studies have demonstrated reduction in HbA1c (15% reduction, p=.001), reduction in total cholesterol, reduction in LDL cholesterol, and reduction in creatinine from oral supplementation of thiamine. Both of these studies could result in FDA clearance for these indications. These are both large markets. With these indications KalibrateV might displace other vitamin supplement products and gain new market positions as main-stream doctors start prescribing these side-affect free therapies.